The Model 562 Miniature panel mount pressure gauge is specially designed to conserve space on any type of equipment where space is limited. The 1½” gauge has mounting studs coming out of the back of the case, and a U-Clamp to secure the gauge in the panel. The front ring is chrome plated with a scratch resistant polycarbonate window. 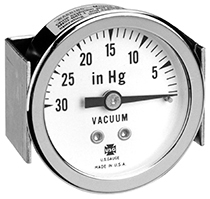 Model 562 pressure gauges comes standard in 11 different vacuum pressure to gauge pressure ranges, up to 2000 psi. It has a 1/8” NPT brass connection, and meets ASME B40.100 Grade B accuracy (±3-2-3%). They are available off the shelf or customized for OEM applications.